Today has really been a tussle. I had to figure out how to get my printer working on my laptop. I actually figured that out by myself. Got this card made and thought I had some software in my computer to tend to my photos, but I guess I was just to used to the program I had been using, so finally went to Hubby's Office and found that software, loaded that myself. Who knew I could actually figure this computer stuff out, but very nerve racking for a newbie. On top of everything else, this is my 500th Post since I started my blog. Check back in a couple of days, I'll be posting some blog candy. We could make our own, or dig in our stash, naturally after digging in my stash I discovered I don't have any Christmas charms except for snowflakes and I've kind of done enough of those lately. I made my own stocking charm, by stamping with gold ink, clear embossing powder, and cutting it out. It was just the right size to fit my card. I'm going to try to squeeze this in on CCEE Stampers Sketch challenge also. 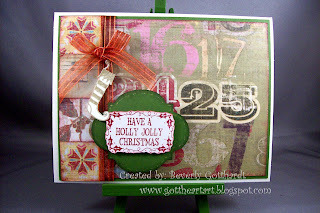 Supplies: Cream Card Blank 5" X 6 1/2" Halcraft, Papers: My Mind's Eye-Signature Christmas Holiday Glitter Book, Stampin Up-Old Olive, Very Vanilla, Stamps: Recollections-Merry Merry, Ink: Stampin Up-Cherry Cobbler, Always Artichoke, Encore-Gold, Stampin Up-clear embossing powder, Sakura Gelly Roll Pen-Gold, ribbon-Michael's, Fancy Pants Designs-transparent die cut label template, pop dots. Just got back from holiday so this is the first chance I've had to pop and see your card. Wow this is just gorgeous. Love the way you created your own charm. Thank you so much for the trouble you went through to make a card. And what a stunner !!! 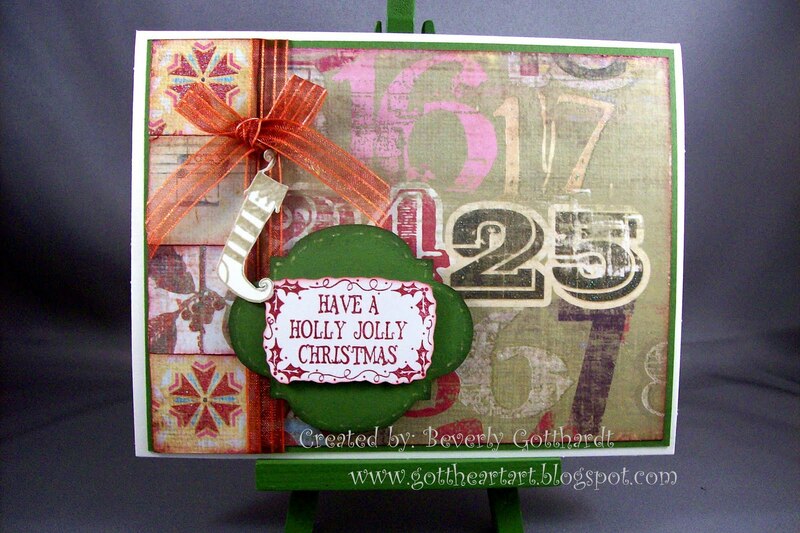 I love your backing paper and WOW what a charm - perfect for our challange. You are just full of clever ideas Bev ... lurrrrve the stocking charm you made. Also well done for sussing out the computer stuff - I'm a total numpty when it comes to technical stuff which is why I've been absent for a few days waiting for help to get into blogger LOL! Still don't understand what was wrong - but don't care now hahahahaha! Charming Christmas card!! Love the papers!! Thanks so much for joining our CCEE challenge!